Tilghman Beach Section. 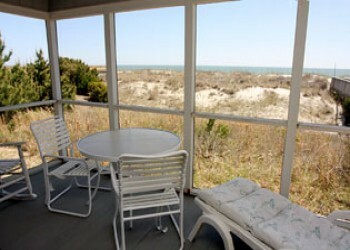 The Summer House, with its awesome view of the Atlantic Ocean, is an excellent choice for your family's beach vacation. There are four bedrooms, two full baths and a half-bath in the main house and a one bedroom/one bath guest suite with its own private entry. Ample windows provide the spacious rooms with lots of natural lighting. Lounge on the extra large oceanfront sundeck or spend time relaxing on the screened porch. You'll also have easy beach access with a private walkway through the dunes. The Summer House is a non-smoking accommodation. Pets are not permitted. Motorcycles are welcome.